It is fitting that the Vickers memorial in Kane cemetery on Bainbridge Island’s north end stands high above the remains of Port Madison’s more illustrious and wealthy citizens. 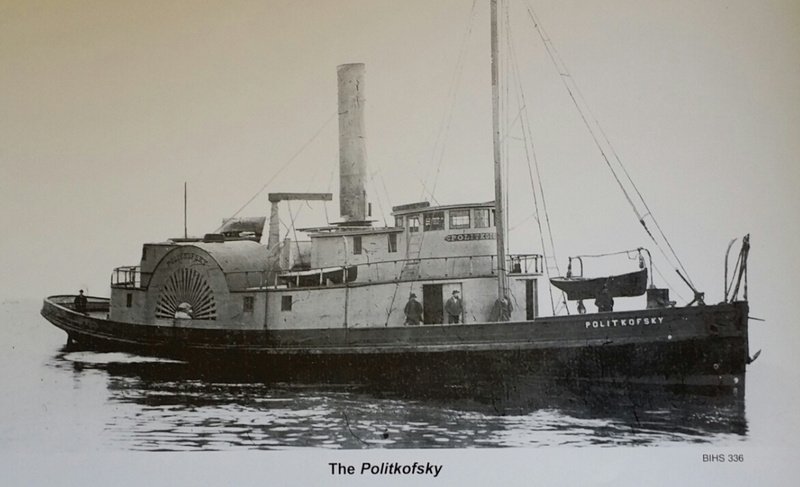 Engineer Vickers was oiling the shaft on the venerable, paddle wheel steamer, the Politkovsky, when the crank fell on his head and sent him to this early grave. The local Masons then took up a charitable collection to order a Carrara marble statue from Italy. Port Madison was then a hard working settlement of shipwrights, millhands and colorful characters who shared a love for theatre. I seem to recall reading that Edwin Booth appeared here. While I can’t verify this particular, historical trivia, I prefer to live in a world where America’s greatest interpreter of Shakespeare intoned his lilting, Hamlet soliloquy under the locally-hewn rafters of the Mason’s Hall. More certain, is that their love for the arts resulted in this moving gesture to an unfortunate member of the working poor. She gazes into the cedar canopy, her left hand elegantly steadying an anchor while, below, carved in low relief on the pedestal, is depicted the venerable Polly, her paddle wheels churning the stone-gray waters of Puget Sound. Joseph Conrad once said that to raise an anchor you must first let it go. I’m not sure what he meant by this laconic statement. Perhaps it is a salty, zen koan referring to a living paradox at the heart of the human condition. Spiritual progress often involves a conflict between opposing impulses of wanderlust and a need to stake out a permanent domain. Perhaps such a dynamic led this British sailor across the Atlantic to seek his fortune here. Perhaps Conrad’s words also suggest another dichotomy. More than a tribute to a single, unfortunate immigrant, the sculpture also commemorates our highest cultural and artistic ideals as translated into meaningful action. These values are true because they are based on the gold standard of love and charity. She is an angelic presence whose power of flight seems to be granted by that very stone anchor; as if she were about to ascend loftier spheres by virtue of it’s symbolic weight as a weathered emblem of hope.